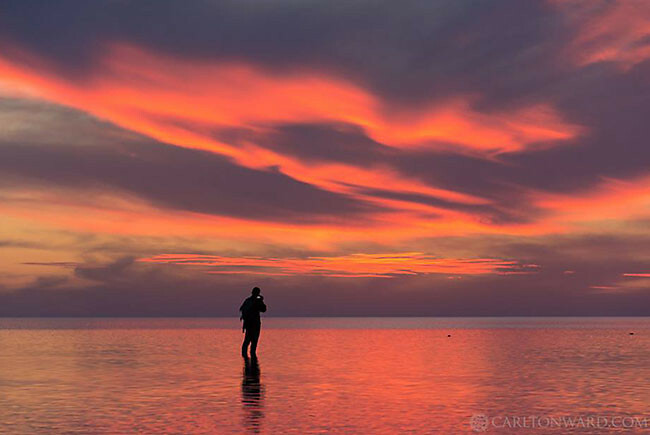 Fiery clouds form over the Gulf of Mexico in Hagen's Cove as Joe Guthrie photographs in the waning light. A tube change was needed due to an angry thorn while crossing the Big Bend Wildlife Management Area. Herpetologist Zach Forsburg handles an eastern box turtle found in Waukeenah, FL. The males of this species exhibit striking red eyes. Joe Guthrie explores a lowland mixed hardwood forest on a private conservation property in Waukeenah, Florida. 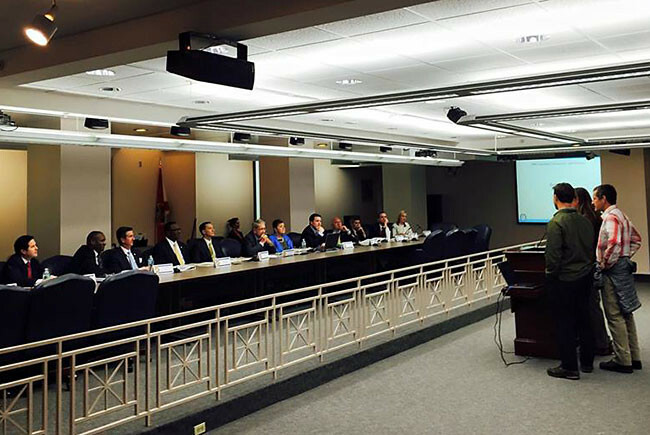 The Florida Wildlife Corridor Expedition team visited the Florida Capitol in Tallahassee to talk with lawmakers about investing in Corridor conservation. The Expedition team presents to the House Subcommittee on Agriculture and Natural Resources. 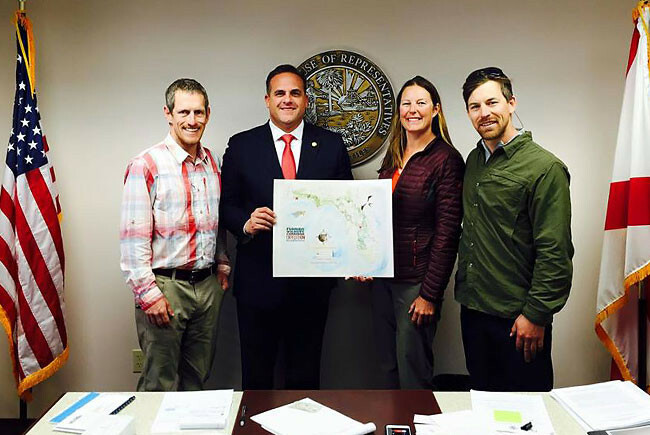 Representative Frank Artilles holds a Florida Wildlife Corridor map after meeting with the Expedition team in his office at the state Capitol. This stretch of the Aucilla River is often called "Aucilla Sinks" for the way the river disappears, then reemerges as circular sink holes in the limestone bedrock. 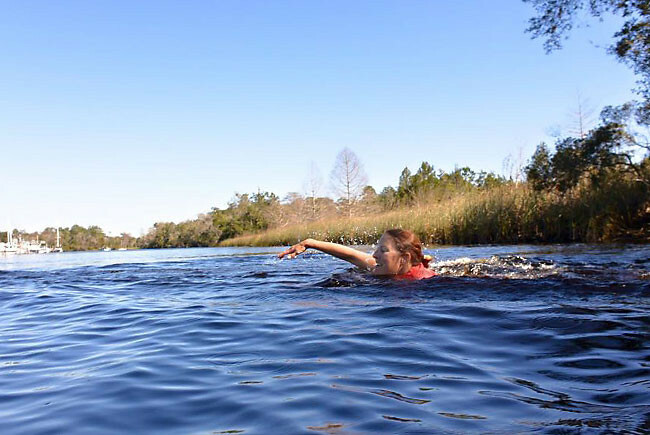 Mallory Dimmitt scouts the St Marks River after an overnight 20-mile backpack on the Florida Trail. Mallory Dimmitt crosses the (cold!) St Marks River after an overnight 20-mile backpack on the Florida Trail. During Week 4, the Florida Wildlife Corridor Expedition team covered a lot of ground. 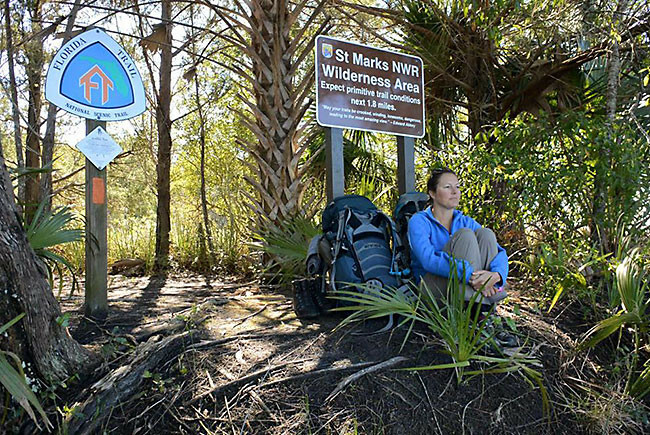 They biked through the Big Bend Wildlife Management area, met with legislators in Tallahassee, hiked the Aucilla sinks trail, backpacked through the St. Mark's National Wildlife Refuge. All the while they documented landscapes and wildlife they encountered. Below are excerpts from the team's Facebook posts. 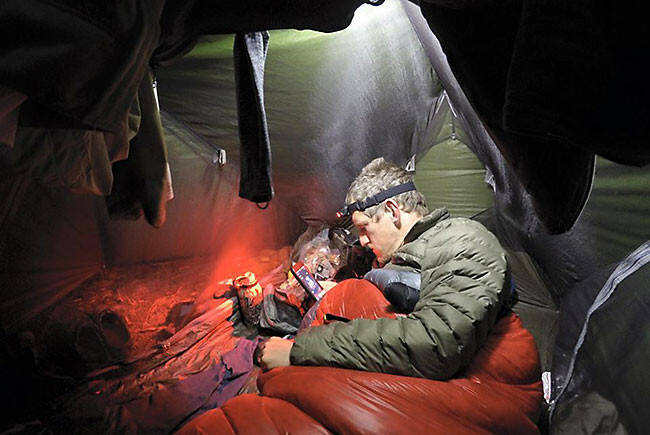 It's hard to believe that we're already starting Week 4 of the 10 week / 70 day Expedition! We're way overdue on thanking all the partners who have made each week possible and special. For the pre-launch festivities and Week 1, we're grateful to the Florida Aquarium, the Black family and Creek Ranch on Lake Hatchineha, FL, The Nature Conservancy in Florida, Southwest Florida Water Management District, MyFWC, Pasco County Parks and Recreation Department, Withlacoochee RV Park and Canoe Rental, and all of our media partners. You can view all of the sponsors who support the Expedition on our website (www.floridawildlifecorridor.org). 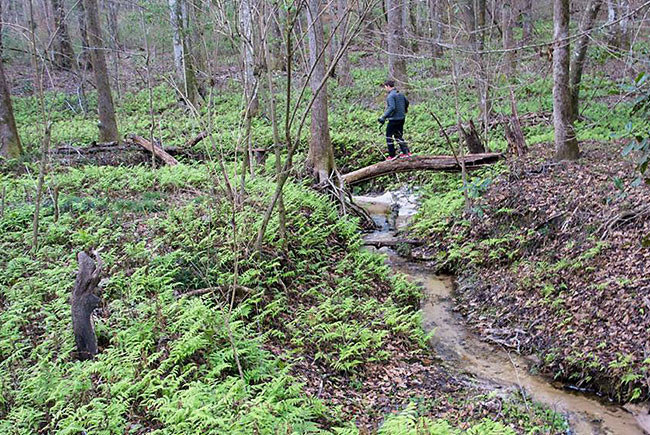 Joe Guthrie explores a lowland mixed hardwood forest on a private conservation property in Waukeenah, Florida, where resident landowners have been restoring the forest for three decades. 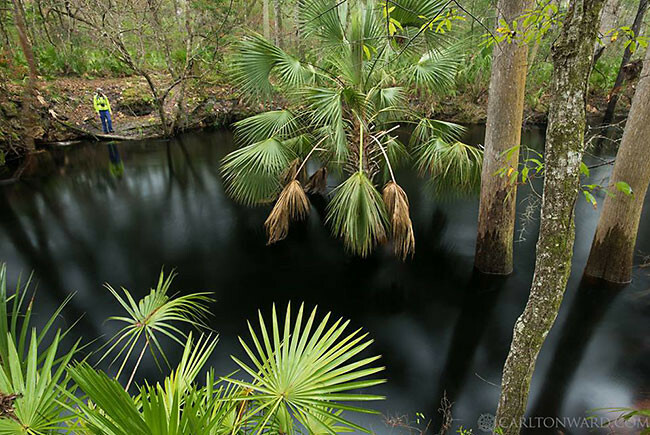 The Florida Wildlife Corridor depends on a combination of public and private conservation lands working together as a whole. Herpetologist Zach Forsburg handles an eastern box turtle found during Expedition Day 24 in Waukeenah, FL. The males of this species exhibit striking red eyes and both genders have intricate yellow markings across their domed shells. 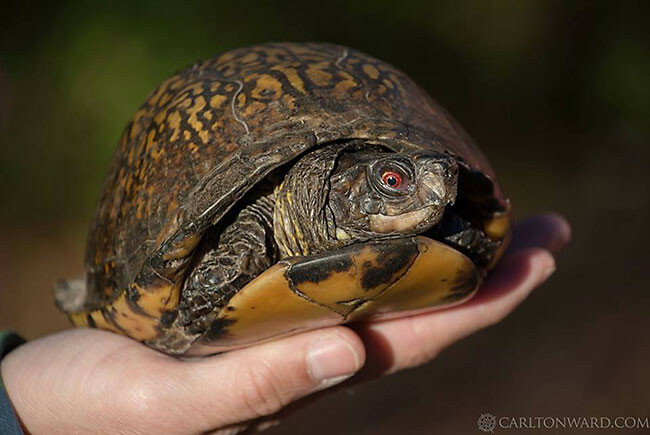 The average lifespan of a box turtle is 50 years with some living to 100 years. 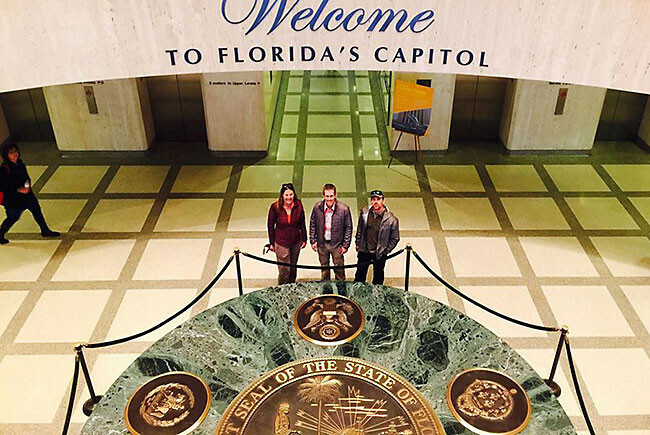 The Florida Wildlife Corridor Expedition team visits the Florida Capitol in Tallahassee on day 25 to talk with lawmakers about investing in Corridor conservation. Photo by Alex Morrison. Beautiful hike on the Aucillla sinks trail this morning; now we begin backpacking s flooded trail through St. Mark's National Wildlife Refuge.